Are you and your family thinking about welcoming a new pet into your home? Studies have shown that more than 60 percent of U.S. households have dogs. This makes dogs the most popular pet in the country. 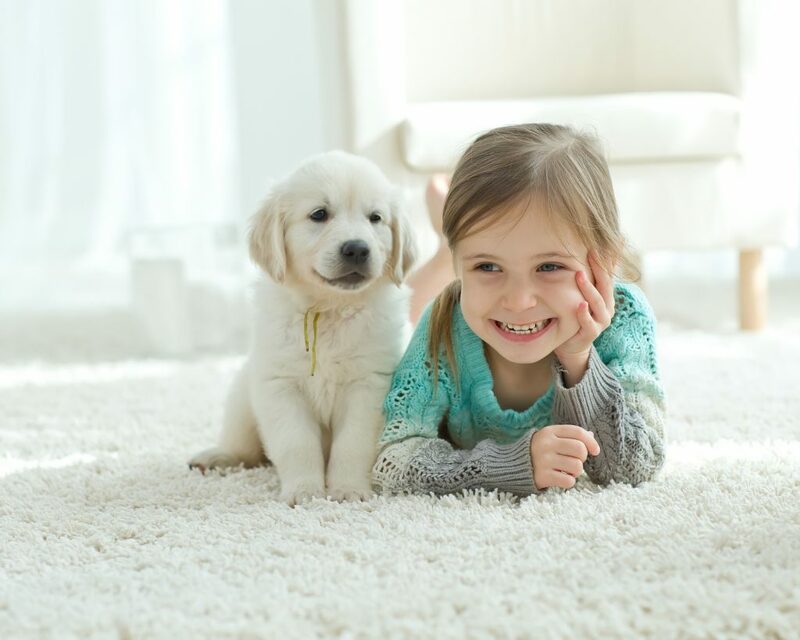 There are many benefits that come along with adding a dog to your home, especially if you have kids. A dog can teach your kids how to be more responsible. A dog can also encourage kids to get outside and play more. But before families decide to mix dogs and children, they should always take the proper precautions to teach them both how to be gentle with one another. This will help families avoid traumatizing dogs and children and prevent accidents from occurring. Here are six tips that will help you introduce a dog into your home without encountering any major issues. Prior to bringing a dog into your home for the first time, sit down with your kids and talk to them about the do’s and don’ts of interacting with a dog. Create a list of safety rules for dogs and children. You don’t necessarily want to scare your kids before they even get a chance to meet your new dog. But you do want to make sure they understand that they need to be careful when interacting with a dog, especially a dog that hasn’t warmed up to them just yet. In addition to talking to your kids about how they’re going to interact with your new dog, you should take the time to work with the dog and teach it some basic commands. You can do this yourself when you first get it or hire an obedience teacher to help. In the event that a dog gets to be too rough with kids, you’ll be able to use these commands to let the dog know it needs to stop. As your dog inches closer to the end of its obedience training, it’s not a bad idea to introduce your kids into the equation. You can have your kids use some of the commands that you’ve taught your dog to show your dog that they need to listen to your kids, too. You can also attempt to get your dog to warm up to your kids by allowing the kids to give the dog treats when they listen. This will serve as a great introduction for dogs and children and show dogs that kids mean no harm. For best results, consider using CBD treats during this part of the process. CBD for pets has been shown to reduce the anxiety that dogs feel while making them more calm and relaxed. It’ll create a better environment for your dog and your kids. No matter how many times you tell kids not to do it, there will still be times when they try to pull on a dog’s tail or play with its ears. It’s almost unavoidable, especially if you have kids that are on the younger side. Try to prepare your dog for this by playing with its ears and tail yourself, and watch how it reacts to you doing it. If it doesn’t seem to take issue with you, it shouldn’t be too much of a cause for concern. But if your dog becomes aggressive in these moments, you’re going to have to be vigilant about watching how your kids treat your dog. Dogs have a tough time differentiating between their toys and toys belonging to kids. Many times, these two types of toys look similar to dogs, which can cause them to go after kids’ toys. Tell your kids about this and stress the importance of keeping their toys out of the reach of your dog. You should also talk to them about how they shouldn’t ever try to take one of their toys out of the dog’s mouth if it happens to get to it. When you first welcome a dog into your home, you’re going to find yourself directing the word “don’t” at the dog a lot. This comes with the territory. But you should also get into the habit of praising your dog early and often. When your dog goes outside to use the bathroom, tell it how good it is. When your dog chews on a bone instead of a shoe, let it know how proud you are of it. And when it plays nicely with your kids, pet it, give it treats, and shower it with praise. Your dog will slowly but surely come around to your kids when you take this approach. And your kids will see how being nice to the dog pays off. Once you’ve spent time introducing dogs and children, you might be tempted to leave them alone to play. Don’t do this! While most dogs will be just fine playing with kids on their own, there’s always a chance something could go wrong. You want to be there in case your kids or your dog needs help. Want some more tips on caring for a new dog? Take a look at our blog for advice on taking care of your new four-legged friend.